Samuel Coles was educated at the Guildhall School of Music and Drama, and was also a pupil of Sir James Galway. He then studied at the Paris Conservatoire winning the Premier Prix in 1987. His many other awards include first prize in both the Scheveningen International Flute Competition in Holland and the National Flute Association Young Artists Competition in San Diego and second Prize in the Jean Pierre Rampal Competition 1987. Between 1989 and 2010 he was principal flute with the Orchestre National Bordeaux Aquitaine, founded the Baroque Ensemble of Bordeaux, and was made professor of the Bordeaux Conservatoire de Musique. 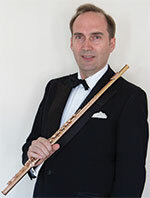 He has played guest principal with the London Symphony Orchestra, the London Philharmonic Orchestra, the Academy of St Martin-in-the-Fields, the BBC Symphony Orchestra, the Opéra de Paris et de Lyon, the Orchestre de Radio France, the Bavarian Radio Symphony Orchestra and the Chicago Symphony Orchestra. He also is a regular guest with the English Chamber Orchestra. He has performed as a soloist with the Philharmonia, the Orchestre de Bordeaux, Orchestre de Paris, Monte Carlo symphony, the Concertgebouw Chamber Orchestra, the Residential Orchestra of the Hague and the English Chamber Orchestra, with whom he recorded all the Mozart Concertos under the direction of Sir Yehudi Menuhin. In 2011 he was appointed principal flute in the Philharmonia Orchestra and professor at the Royal Academy of Music in London.